My prospective customers frequently ask me the above question. In addition they want to know whether agile and scrum are same. I list the following example to them. Suppose you want to buy a car. Then based on your needs you either go for SUV or Sedan or Convertible or Coupe or Mini Van or Van or Hatchback or Sports Car. Once you decide the type of car, then you select car’s make, i.e., whether to buy a car from Mercedes or BMW or General Motor or Ford or Toyota or Nissan or Jeep or Suzuki or Hyundai, etc. In similar fashion based on your project’s need, you decide whether to follow Agile methodology or Iterative methodology. 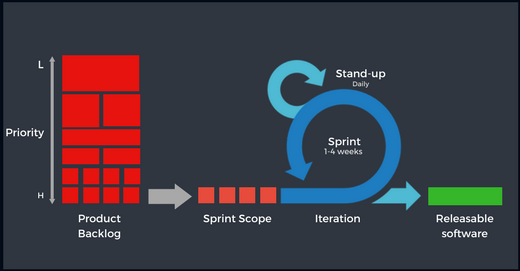 Once you decide that you want to go for Agile methodology then you decide which process from the Agile methodology you want to follow, Scrum or Extreme Programming, Adaptive System Development, DSDM (Dynamic System Development Method), Feature Driven Development, Kanban, Crystal, etc.